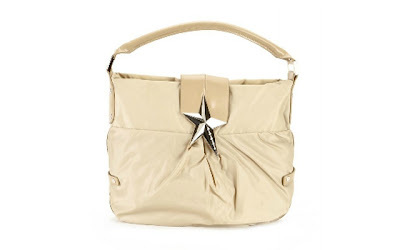 The Mugler by Thierry Mugler Cream Fabric Hobo is currently selling for just $89.00 on SmartBargains.com! You will be saving 74% off the listed price of $340.00 with this fashion deal. Save an additional 10% off when you checkout using SmartBargains promo code: WMP6324021413114450210110958, making this handbag just $79.00! This offer is valid for a limited time only. This leather trimmed fabric bag measures 13.5" L x 12" H x 3" W and is adorned with the silvertone signature Theirry Mugler star. Standard shipping is free within the continental U.S.! Quantities are always limited on SmartBargains, so do not wait too long to checkout if this bargain is right for you.